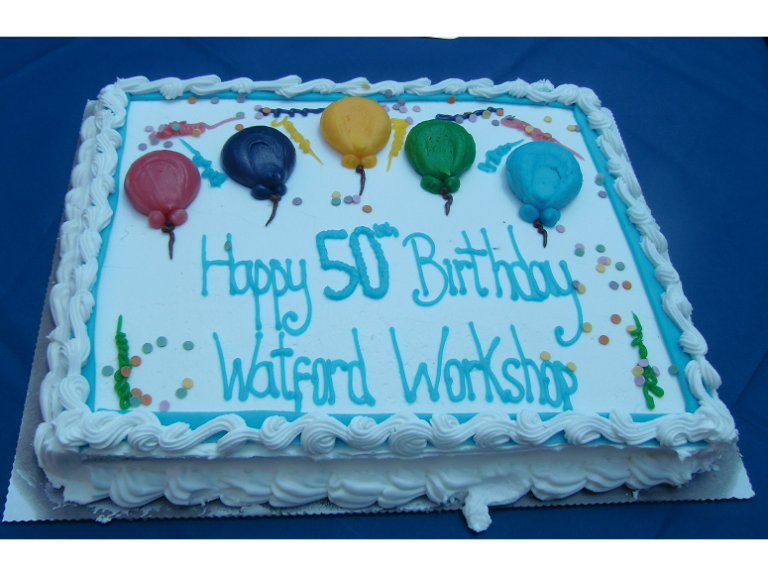 Watford Workshop holds 50th birthday party! A beautifully sunny day enjoyed by all! There was record attendance with over 150 people including people working at the Workshop, volunteers, customers, friends, family and supporters. Our Patron, Richard Harrington, MP for Watford, came specially from Westminster to celebrate with us. Richard was the lucky winner of one of the raffle prizes, a beautiful picture created by one the workers at the Workshop, Daniel Jacobs, who is a talented artist in his spare time. The raffle raised £300, with many prizes generously donated by supporters and friends. Author Ken Balneaves attended in person and handed out a hardback copy of his book, the Greatest Gift (won by our Chairman Gordon Sellers who was wearing a magnificent seasonal hat for the occasion). We would like to thank our sponsors, local firm of Chartered Accountants Myers Clark and Watford printers Metroprinting who made the event possible. Pictures of the day can be seen on our Facebook page - click here.